The ancient Aztec weapons were a mix of long and close range tools, that allowed the Aztec to fight their foes at any range. The long range weapons, the spear, and the sling like the Tlacochtli and the Tematlatl would allow the Aztec warriors to rain down projectiles on their opponents before closing the distance. Once close the Aztec weapons allowed them to cut, slice, stab and bludgeon their foes. The Aztec sword the Macuahuiti was a primary melee weapon used in close quarters, but they also had their Tepoztopilli spear if they wanted to keep the enemy at arms length. 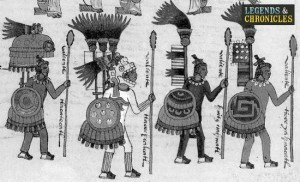 The Aztec also used weapons like clubs and knives, like the Quauhololli and the Tecpatl, which allowed them to easily finish fights up close. As in most civilizations, weapons would be earned by a warrior throughout their years, and the Aztec society was no different. As the Aztec progressed his choice of weapons would grow with the warrior. As they moved from commoner to warrior, from warrior to noble warrior, from noble warrior to Eagle or Jaguar warrior and in some cases al the way to Otomiti, Shorn One and Tlacateccati. The Macuahuiti was one of the close quarter melee weapons of the Aztec warriors and was a mix of club and a sword. The Macuahuiti was a flat wooden weapon made from a single piece of wood, with a handle and a flared head. The Macuahuiti had grooves on the head which the Aztec’s would affix small sharpened blades. The blades themselves were small individual pieces rather than one on each side and they were crafted from obsidian. The obsidian blades would be affixed with natural glue. The Macuahuiti was an effective weapon for the Aztec’s and would allow the the Aztec warriors to strike, cut and bludgeon their opponents. While The Macuahuiti allowed the Aztec’s to cut and damaged their foes, the weapon itself would not be used to critically maim their opponent rather to cause cumulative damage, although some reports indicate that The Macuahuiti was suitable for severing limbs. The blades of the Macuahuiti would often need maintenance and repair. While the obsidian stone the Aztec used would allow them to create incredibly sharp edges, in some cases sharper than metal. However the obsidian is more fragile, and would mean that the Aztec would perform regular maintenance to ensure their favourite melee weapon was at peak performance. The Tecpatl was an Aztec knife or dagger that was constructed from an obsidian blade affixed to a wooden handle. The Tecpatl was traditionally a sacrificial weapon on the Aztec when they would make a blood sacrifice to appease their gods, but the Tecpatl would also be used in a battle as a close quarter fighting weapon to finish their foes off where needed. The Tematlatl was a sling and of the Aztec warriors ranged projectile weapons. The Tematlatl was made from natural fibres that allowed the Aztec warriors to engage their foes from long distance. The Tematlatl was believed to have a range equal and in some cases superior to the arrows, and the Aztec would use them to pelt their opponents. The stones that the Aztec used with the Tematlatl would be custom chose, and traditionally would be sharpened to cause more damage on impact, although of course stones found in the heat of battle were also suitable for use with a Tematlatl. The Atlatl wasn’t a weapon in itself but was a projectile launching device used by the Aztec warriors to throw their Tlacochtli spear over a longer range. The Atlatl worked by adding extra leverage by extending the arm by another forearms length. This would allow the Aztec to launch the tlacochtli spear a much greater distance. The tlacochtli itself was an Aztec spear, that the Aztec would launch with the previously mentioned Atlatl. The tlacochtli itself was similar in construction to the Tepoztopilli, it had a wooden shaft and a small wooden head. The head of the tlacochtli was grooved on the sides, and lined with sharpened obsidian to allow the tlacochtli to piece or cut anyone that it would strike. The Tepoztopilli was essentially a spear weapon the Aztec warriors would use in close quarter and short range combat. The Tepoztopilli was again a wooden weapon, traditionally made from two pieces the shaft and the head, the Tepoztopilli head would be of similar construction to the Macuahuiti, with a groove along the sides that obsidian blades inset. The Tepoztopilli would be used to keep the enemy at a distance with striking and lunging motions where the sharpened tips of the Tepoztopilli being able to pierce light armour with ease. The Quauhololli was essentially a mace or club, typically made from either wood or a combination of wood and stone. The Quauhololli was a melee weapon used by the Aztec and featured a curved handle for ease of striking, and with the mace head, was able to strike foes with solid force. A Huitzauhqui was an ancient Aztec weapon, that was essentially a large wooden club, with a solid body which featured the head and the handle. Another melee weapon of the Aztec the Huitzauhqui was used in close quarters and was typically larger than the Macuahuiti, and in many cases had similar obsidian blades attached.